It can be really hard to stay on top of the dirty clothes your family create. It can soon have you overwhelmed by dirty laundry and desperate for a solution. You dream that one day the laundry basket will be empty for more than three seconds! In this post, I share with you some quick tips to speed through the laundry mountain, get you into a laundry routine and we’ll even show you how to get your kids doing laundry! The laundry pile can triple in size in the blink of an eye, you dream that one day the laundry basket will be empty for more than three seconds but an empty basket only seems to last a few minutes when you have a busy household. Knowing how to get laundry done faster can seem like a daunting task when you’re overwhelmed by laundry. I have tried a lot of methods and have now managed to get into a great routine which keeps me on top of the laundry mountain. There is no sorting to do. The basket you have washed and dried gets put away into one person’s room unless it needs ironing. Iron upstairs and put it away straight away, this helps stop laundry hanging around downstairs waiting to be folded and put away. Ironing immediately prevents a massive ironing mountain and guarantees that the kids have school uniforms and sports kits always on hand, it also ensures there is never any emergency ironing. I wash my spouses and my clothes together as they are going to be put away in the same room. 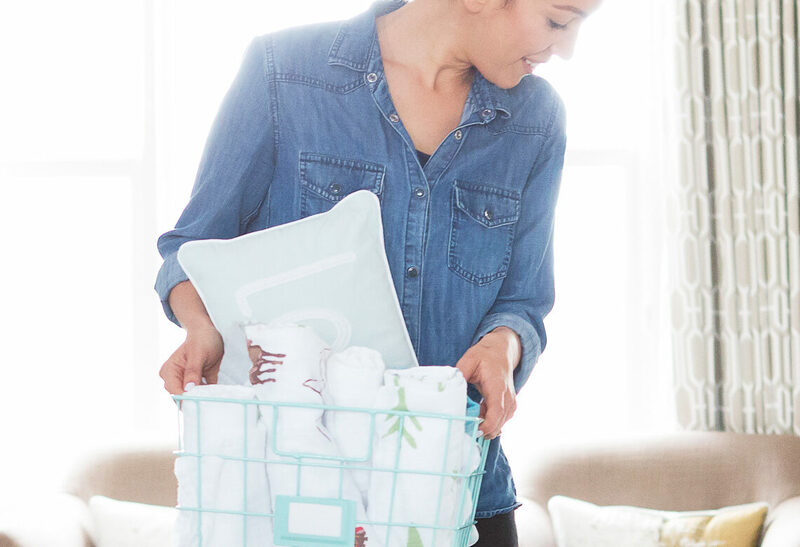 Use laundry baskets for each family member. a) It’s more convenient for your kids to drop their laundry in the basket than to take it to another room, therefore you’re less likely to get a pile of dirty clothes on the floor. b) it encourages your kids to be responsible for their laundry and is good for self-improvement. I insist everyone in my house to puts their clothes straight into the laundry baskets and it really has reduced the pile of clothes waiting to be put away each day! Always complete the full laundry cycle from start to finish. Whenever possible, wash, put the clothes in the dryer and put them all away on the same day and you should try not to start washing a load of laundry unless you know you can complete the full cycle. This is the best way you will stay on top of laundry management! Wash what you wear daily. If you don’t at least wash was you and your family have worn daily you are always going to have a pile of dirty clothes and if you miss another day you can easily become overwhelmed by laundry. A simple way to think of is it that the dirty laundry pile is like the dirty dishes pile in the kitchen sink. you wouldn’t leave the dishes for a few days because the pile of dishes would be unbearable and soon mount up, so you make it your priority to wash your dishes after every meal, it only takes a few minutes but the benefit is having clean dishes and a clear kitchen. apply the same rule to your laundry routine and you’ll soon have an empty washing basket. keeping on top of the daily laundry means that when you wash bedding and towels it won’t send you over the edge! When you have a young family you can always find a full load each day to wash. I have a 10-year-old who has several outfit changes a day and has a terrible habit of putting unworn clothes in the laundry basket because it’s quicker than hanging them up. And my 6-year-old is muddy 30 seconds after getting dressed! When the kids have been swimming, or they are going somewhere muddy, make sure the washing machine is empty before you go out, so wet towels or muddy sports kits can go straight in the machine to be washed when you get home and are not sitting by the washing machine or in the laundry room. Always put away clean laundry immediately to avoid clothing clutter! It can be really difficult to find the motivation to do laundry sometimes but if you time yourself, you’ll find it literally only takes a few minutes but makes a huge difference and prevents you from getting overwhelmed by laundry. Prioritise work shirts and school uniforms. Try to prioritise work shirts, school uniforms and sportswear above everything else, so they are always clean and ready for your children and spouse every morning. It’s very easy to wash uniforms quickly when you have laundry baskets for each family member. Try to iron at least every other day whenever possible to avoid emergency ironing and to stay organised, minimise chaos and to ensures your family always have clean clothes each morning. It’s essential when washing whites to make sure you separate them out from everything else. To keep white clothes very white make sure you don’t wash them with any other colour even beige! If you have clothes that are white with different coloured trim, I would suggest hand washing those items on their own. If you do mix whites with any other colours, you’ll soon find that your whites start to become grubby and dirty looking rather than crisp and white. lthough it’s not as important to separate colours, it will keep your clothes looking fresher for longer if you group them together as much as you can. A few of my clients who work full time, ask me to do their ironing for them. I love ironing so its a win-win situation for us all. if you are struggling with working full time and trying to keep up with the family’s washing and ironing getting help can prevent you from getting overwhelmed by laundry and take some of the pressure away. However, it can be quite expensive to pay for outside help. 1) If they can work an iPad or a games console they can work a washing machine! as can your spouse! 2) If they can drag their bicycle out of the shed, they can carry a small washing basket! My kids bring their washing baskets downstairs when I ask, they can sort the whites out and put them in the washer, they can fill up the powder and switch it on. They both know how to work the tumble drier too! I don’t expect my kids to help all the time or to do their own laundry, but it’s great that they can be part of the team when I’m feeling overwhelmed by laundry and other jobs, or if I’ve been at work all day. Kids love to help, and I believe that teaching them valuable life skills is hugely important from an early age and is good for self-esteem, self-confidence and self-improvement. Following the routines above, enable you to know where most items of clothing are at any time, this is critical when you have several people asking you where their favourite item of clothing or sports kit is! When you’re overwhelmed by laundry it can be daunting looking at the huge pile of clothes staring back at you. If I find I’ve fallen behind and had a mountain of laundry, which I often do due to our busy schedule, I catch up by washing each load of washing by a family member. When it comes to folding and putting it all away, it all goes into one person’s wardrobe, there is absolutely no sorting to do! I just take the clean laundry basket to the family members room and put it straight away. This is how to put away laundry fast! Iron it if you can! When I first decided to start washing by family member, I put a small wicker laundry basket in my kid’s rooms and asked them to drop their dirty washing in there. This was a game changer in our house when it came to dirty laundry solutions! My 6-year-old loved using his basket, but, my 10 year old preferred to drop a pile of clothes all over the floor, however, with perseverance and nagging, she got into the habit of popping it into the basket, and realised that if it was not in the hamper, it didn’t get washed! My spouse still likes to pile clothes by the side of his bed rather than use the laundry basket, but like they say you cant teach old old dog new tricks! To learn how to teach your kids to help with the chores here. It took me quite a while to remember to check in the kid’s rooms for laundry rather than in one central laundry basket but eventually, it just became a habit. Take one person’s basket downstairs and wash their load only. Wash one white load and one coloured load if necessary. If there isn’t enough washing, add a towel to the load, but you will probably find there will be piles of laundry to wash if you have a family! Dry it, fold it, and put it away immediately. There are a few things to consider when choosing a time of the day to do laundry. The weather, if you like to line dry your washing, check the weather forecast and plan to wash on the clear days especially if you are at work all day and can’t pop out to bring it in! The time of day, some electricity providers give you cheaper electricity at night to encourage people to use less electricity during the day. If you put a load of laundry in the washing machine before you go to bed and delay the start or use a timer, it will finish just before you get out of bed in the morning, allowing you to hang it out before you go to work and save money! How busy you are, on the days you’re not going to be in, do very little washing to avoid laundry going mouldy in the washer for days! How many loads you have to wash, don’t start your first load of laundry at midday if you’ve got lots of laundry to get through, start your first load while you’re asleep using the timer! The priority of items being washed, prioritise uniforms, work shirts and sports kits before casual clothes, as these are worn and needed more regularly. Prioritise getting them washed dried folded and put away as soon as they hit the washing basket to avoid the chaos of last-minute ironing! Knowing how to keep socks together can be the bane of the washing schedule! I have a simple trick to keep socks together without any sorting at all! If you wash by family member all their socks will be together in the same load, all the same colour and there will be no matching! You can thank me later! Can underwear be washe together with socks in the washing machine? You can what whatever you like together in the washing machine, however it is advisable to wash you underwear separately from anything else. Use a small laundry bag to put your underwear in if it is delicate. its a good idea to use a small net bag to wash your sock in as it will keep them all together and will be much easier to put away after drying! Will sun drying damage clothes? Some clothes can be bleached by the sun. some damage can be caused by suncream on white clothes which can often turn bright red when dried in the sun! I feel so overwhelmed by all my health issues, how do I deal with this as well? If you are suffering from ill health or depression only do what you feel you can manage on the days that you feel you can. try to enlist some help from friends, family and your spouse. let someone know that you are struggling and seek help from your doctor if you are feeling realy overwhelmed. Can I use laundry detergent to wash dishes? Laundry detergent is not the best thing to wash dishes. However, it is great at getting burnt food from off the bottom of a pan if you’ve accidentally left something to boil dry. Just add a couple of tablespoons of laundry to the bottom of a pan add a couple of cups of water or cover the bottom of the pan, then leave to soak for a few hours or overnight if it’s really bad. All the burn bits should just lift away without any scrubbing! What is the best thing to do when feeling overwhelmed with laundry? Having simple routines to follow can help you stay on top of the daily jobs and help to prevent you from being overwhelmed by laundry and housework. If you feel you’ve just got too much laundry, consider creating a capsule wardrobe for your kids, read how here, it can really help when you feel overwhelmed by laundry as it brings some order to the chaos. If you’re wondering how to catch up on laundry, start by trying to reduce laundry. You can do this by simplifying your wardrobe, consider creating a capsule wardrobe for yourself, read how here it can make getting dressed much easier and help reduce your own pile of laundry! Are you overwhelmed by laundry? Do you know a good laundry hack? We’d love to hear it! Drop us a line in the comments! How To Start A Summer Capsule Wardrobe. To receive your FREE printables and MORE! Leave your info in the box below! If you liked it pin it! I hate doing laundry, but it the one thing that we decided would be “my” job – most things we share or do together, but early on it was decided that I would do the washing and my husband would do the bathroom. I think I definitely go the downside of that agreement! I probably have one day out of a whole month where I don’t have a pile of washing to sort though. I know if I did it every day it wouldn’t take me long, but I can just never get in the habit. I like your idea of doing a load a person, so you only have their washing to put away. Very good tip! My husband mostly does the laundry 🙂 I’m so lucky! Send him over to train mine please ..he has difficulty locating the washing basket ! The dreaded laundry mountain! Some great tips, I like the doing it by person one I hadn’t thought of that! My husband also doesn’t seem to be able to put his clothes in the basket! I actually love organising the washing basket, i put into the whites, darks and colours and where the darks always need more than one washload i categorise work clothes with underwear and then casual clothes. Darks are always first in the wash! If im honesy i love doing the laundry nothing makes me happier, but the nly real issue is, is that i’ve not enough space to dry everything, but roll on spring so that clothes can go outside!